Hello! It’s that time of the year again – time for fall clothes! The fall rollouts at J.Crew are the ones I look forward to the most. I’ll be honest, though, while there are items I liked in this latest rollout, there aren’t a lot of “must haves” for me at this point. I am glad to see a lot of the same styles from last year (wide leg pants, cage flats, etc.) and as I have said in previous posts, I’ll be looking for ways to re-style my classics as we head in to this fall and winter. I like a lot of the neutrals being shown this fall, but I do miss the signature prints we’re used to from J.Crew. I’m not a big critter or fruit on clothing person so the latest showing of cherries isn’t doing it for me (I know a lot of people like it so to each their own!) I have always been a fan of windowpane prints, so I’m excited to see this classic print at several of my favorite retailers…the question is which items to pick. Ok, enough of my rambling, onward to some try-ons! First up, the A-line Dress in Silk-Twill Windowpane Print. I’m wearing a size 12 which was the right size. I know many of us (me included) have been asking for longer dresses/skirts so I don’t want to complain, but…this was a little too long for me. I think a few inches shorter and it would have been perfect. It’s at least an inch below the knee and I’m 5’8″. So if you’re tall – this dress is for you. I found the bodice to fit well but some of the seam stitching in the waist/hip area didn’t lay as flat as I would have liked them to which hurt the lines of the dress. The colors in the print are navy/brown and white which aren’t my usual color scheme. This is a pass for me. If you were so inclined, it could definitely be taken up, but I would have only done that had I loved the colors. Next up, the Two-Piece Dress in Silk Baby Dot. 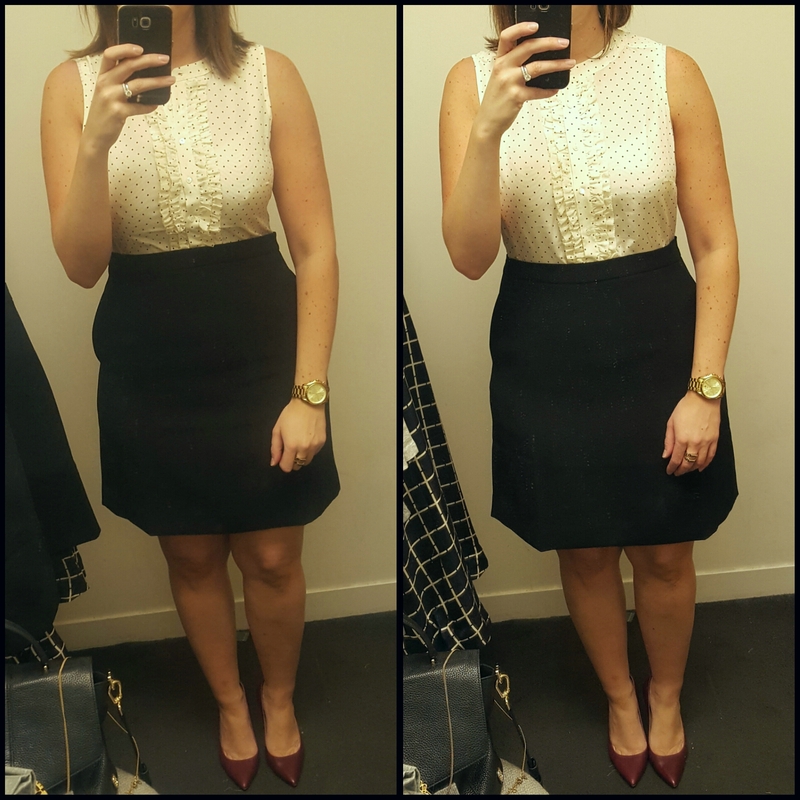 I started with a size 12 in this dress (shown in the right photo) and found it to be too big in the waist so tried the 10 for comparison (in the left photo). I liked the idea of this dress a lot in concept but it was too short waisted for me. The size 12 was too big through the waist area but good through the hips and the size 10 was a little too short and the pockets stuck out in the hip area. Both blouse sizes were ok. I would swap the top/waist of the size 10 with the skirt of the 12 (story of my life!) If you’re shorter waisted this will work for you and take the smaller of your two sizes. The top is a lighter weight silk and the skirt is a textured crepe feeling poly. I am bummed this didn’t work on me. Next up, the Flutter Sleeve top in Cherry Print. This is a size 10, which is a size down for me, so it runs a bit generous. However, as I stated in my previous post, now that I have bras that actually fit me, I think I have a new normal for what size fits me so it’s going to be a bit of an experiment. As I said, I’m not a big fruit/critter person. It’s just me…I know a lot of people like it. I like that these aren’t blatantly cherries but it’s still a little too quirky for me. But I like the flutter sleeves and I was pleased to see that there’s a patch of fabric sewn in under the arms of this top to prevent the low arm holes we’ve been seeing on a lot of tops. So thumbs up for that! This blouse silhouette is perfect under a suit and I like that the sleeves aren’t too fluttery. Next up, the V-Neck Swing Sweater. I’m wearing a size Medium in this sweater so it has a more generous fit. The material on this is a wool/nylon/viscose blend which is reflected in the price. I should have grabbed a color to try on – in addition to the grey, this sweater also comes in heather burgundy, heather lavender, spicy jade and black. I am not terribly sensitive when it comes to scratchy sweaters but this sweater is slightly scratchy. I liked this sweater and even more so for the price point. It’s on my list and would be a solid weekend casual sweater. I’m also wearing the Distressed Toothpick Jean in Pamona wash (size 32). I grabbed the jeans so I’d have pants to try on with the more casual tops. I have my share of skinny jeans in my closet so these are a pass right now. I find myself reaching for the less skinny/more straight leg or boot cut these days. Next up, the Tippi Sweater in Jacquard Dot. This also comes in a dusty lilac/cabernet version. But of course…grey and black for me. This is a size medium. If I wanted a looser fit or to layer underneath it, I would size up to a large. Polka dots, what’s not to love? This was a winner for me and it would get a lot of wear in my wardrobe. It seemed a bit thin which I think is how most of the Tippis have been recently but I love the dots and I can’t seem to get enough of the Tippi sweater. Lastly, the Campbell Blazer in Donegal Wool. I’m wearing a size 10 which is the smaller of my two blazer sizes. I like this blazer a lot – the cut is flattering and I like that it doesn’t lose my curves. 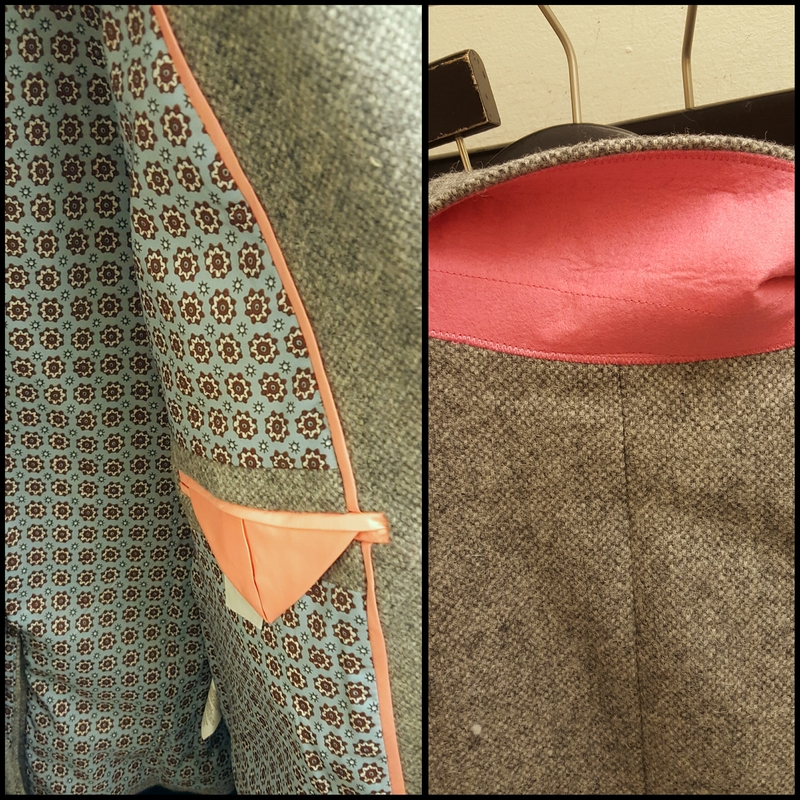 I was excited to see a fun lining and while I don’t usually pop the collar on my blazers, the hot pink flannel underneath the collar is a fun touch. I don’t really need another grey blazer, but I’ll keep an eye on this one. So, that’s it for now. I have a few other more casual items that I’ll review in a separate post. Do you have any favorites from this rollout? Would love to hear what you think and thanks for visiting! Thanks for the great reviews! I especially appreciate the detailed pics and description for the blazer. It looks very nice. I’m not loving the cherry print either, not for me anyway. I’m sure someone could pull it off and make it look fabulous.